A former NBA player is suffering and another former player is taking the league to task for failing to do the right thing. This was the back and forth between a random NBA fan with a smart-phone and the 32-year-old former NBA player, who was seen walking into a Jack-in-the-Box wearing a hospital gown and no shoes, the skin hanging loosely on his emaciated face. West has long been public about living with bipolar disorder, yet in a 2012 interview with The Washington Post he said that he felt that he was misdiagnosed and that he was no longer taking medication. Now he is out on his own, and it does not look good. This is a deeply distressing situation. It also raises the question about what responsibility the NBA has for the mental health of its current and recently retired players. 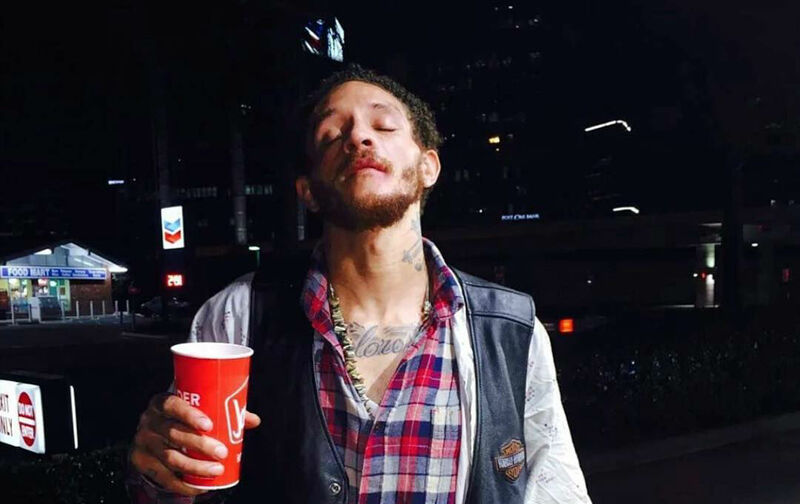 Did Delonte West have access to psychiatric help as a player? And more importantly, was it made clear that any effort to receive mental-health assistance would not reflect negatively on his opportunities in the league? As the number of people with mental health conditions continues to grow, so does the need for awareness and support. The stigma surrounding mental health stands firmly as a road block to optimal awareness, diagnosis and support. Through open and candid conversation, we plan to help dissipate that stigma to create incredible new care opportunities. We believe this will create a much clearer picture of the mental health landscape and will allow awareness, diagnosis and support to reach new plateaus. Read the letter below in its entirety. Substitute “NBA” for myriad other corporations or institutions and it will sound all too familiar. We, to put it mildly, have a ways to go when it comes to bringing these issues out into the open. It is with great humility that I write this letter to the people it is addressed to. I believe that transparency is necessary for there to be any chance, at real progress, in anything humans endeavor on together. With this in mind, discussing my anxiety was never a fear or shame, nor will it ever be. On the contrary, being humble enough to level with your neighbor and communicate openly, I have always viewed as a strength. This idea encouraged me to disclose my affliction with the public while still in college. I put myself in a position to be fairly judged by our industry and the rest of the world. I did so because the courage to share our struggles with each other serves as the only true foundation for creating the proper support. It is in this capacity I am hopeful and very ambitious to find resolution in this matter. Although honesty has not served me well in our industry thus far. I am still here, transparent and interested in doing what is right. It is now after four patient years, I’m calling the NBA to action. What is encouraging, is the people this letter is addressed to are the only people needed to make the necessary changes regarding the attitude toward mental health, and to improve our policy and support, in black and white ink. A quick glance back, it was three years ago that I questioned the mental health policy of our league. I, who lives with Generalized Anxiety Disorder (GAD), thought it imperative that our policies and procedures reflect everything that is known in regards to mental health. They obviously do not. I felt the absence of improvements would only lend to a very misinformed perspective. Hence an illogical attitude and procedures involving mental health in our league. It my fear that perspective could very well create real health risks for myself and others players by way of mismanagement. I implored that owners, general managers and coaches should not have substantial influence regarding medical situations. This was an idea reinforced by the leagues own medical confidants. Our leagues existing protocols on physical injury and illness were built to add some protection for players from mismanagement in medical situations. In a business where human beings are the commodity, the conflict of interest involving health, for clubs and their managerial personnel is all too apparent. Our Collective Bargaining Agreement (CBA) requires clubs to consult with people whose sole purpose and expertise is the wellness and health of the player. However, even in the case of the injuries and illnesses that our existing (CBA) does address, (which doesn’t include mental health) still allows teams to decline the recommendation of its own medical staff. In which case the player, deciding to take the teams doctor recommendation, could result in arbitration. This is clearly a problem as well, but an entirely different discussion. Unfortunately, in the absence of a clear mental health protocol or program entirely, the risk for mismanagement is significantly increased. In Houston, that risk turned into result for me. There was very clear mismanagement during my time in Houston. From manipulation and interference with doctors to the lack of clear rules and interpretation of policy being used to instigate the conflict. During the time of our negotiations until this very day, I have been told by multiple people in our industry, including people from within the Rockets organization, that I was undoubtedly right about the mental health policy. Which is hard to argue, one read through our (CBA) at the Rookie Transition Program (RTP) showed me that. Shockingly, the consensus throughout the NBA that was communicated to me was no one would listen unless I played well. Unless I made myself of value to the league and the owners. I was told that saying something true is no longer enough to bring change or solution. In this society, where perception is everything and the dollar becomes so influential to our moral compass, I needed more then to just be right. I needed a feel good story, the publics’ vote or an athletic prowess and performance value leverage to discuss the real issues. I felt wrong about that idea then and I feel wrong about that idea still today. If there is a visible path, that would improve the health and well being of players, of people, it should be explored. There should be no need for any superficial platform or success to make logical forward movement. I think this to be true of navigating all issues, including but not exclusively mental health. There’s obvious fundamental business benefits of having healthier players in an industry where you buy, sell and trade players (humans) as commodities. However, there should be an even greater moral obligation to do what is right by fellow human beings and their health. Especially if you’re selling them as a product. If mental health isn’t seen as symbiotic with players overall health, we’re doing everyone involved an unnecessary disservice. Some people addressed in this letter share a perspective of, “Who are you to call us to action about anything?”. Given the angles used by certain media to cover my story and the gravity of the misinformation age that we are waist deep in, I find it only fair that I remind you exactly who I am. I’m not a kid who can’t play because of anxiety. I’m not a kid who can’t get on an airplane. Although those profiles made for formidable yellow journalism, they in no way represent the truth. I flew in college; I had anxiety in college, and was very successful as an athlete and student. Mostly because I had a community in Ames that really embraced simple humanity for one another. An attitude led by my former head coach, Fred Hoiberg. Never once have I missed game due to anxiety or flying. I’m sure most of you already know this, but I thought it only appropriate to sort facts from farce. The deeper truth is I come from a modest upbringing. I am the son and product of Middle America. I am a father and brother. I am a basketball player who earned the right to play this game on the highest level, through hard work and much adversity. I did so in very dangerous places. This upbringing created a man who believes this country is about more then profit. I am a man who believes integrity and morality should never be for purchase. Not with money, vices or the adoration that accompanies being an elite athlete or any type of “celebrity”. Most importantly of all, I am a human being who has the right, in this country, to request that people who have the ability take up the responsibility to do what is right. Even if the right thing is inconvenient and untraditional. I’m not a billionaire; I’m not an All-Star. I was told by the Rockets, to set an example to millions that they can “overcome their condition”, by playing and being successful. I cannot support that message. I believe men, women and children in this country and around the world should be able to seek support no matter what their circumstances are. They should believe that they are important no matter who or where they are, and especially no matter what they have. I will not join in sending a message that to self-advocate, to be transparent and to expect humanity is reserved only for those who are successful. For one, success is too fluid of a concept and too rarely obtained to be a determinant of humanity. Two, the majority of Americans will never play in the NBA, will never make millions of dollars or be “successful” in a way measured by you. What happens to those people, the majority? They will have to persevere by being transparent and brave enough to ask for help in the most darkest of places and times. They also will need to know, that even when they perceive themselves as worthless or invaluable, the people they reach to for proper support don’t share that perspective. That is the only message I am interested in sending, that is who I am. I have been ostracized for who I am. Many of the owners associated with this league are not only buyers and sellers of the game of basketball. You collectively, represent captains of many industries. As a group who has all the access to resources and knowledge necessary to do what is right by the mental health topic, that alone amplifies the obligation to do what is right. Mental health and policies reflecting support, actual support, need to be of the highest priority. I love the game of basketball and the NBA. I grew up in the 90’s. However, turning away from advocacy for mental health and human welfare, is not an option. Nor should it be an ultimatum. “…That’s the way it is…” is not an acceptable excuse for inaction. That rhetoric has also been thrown around in my situation many times, when discussing the balance of human welfare in this industry. Finally, it is through many mediums that those with mental health conditions have been made to look weak or cowardly. They are made to look like the minority that burdens our society and needs strenuous or special treatment. This idea is inaccurate and in some cases, used as a scapegoat to accountability. Many people in our country are functioning with mental health conditions. Aside from those with “conditions”, everyone has a mental health and should take it seriously and educate themselves on constantly maintaining and improving it. Mental health conditions are more common then heart disease, cancer and diabetes combined. Mental health is a vast term, with many dynamics, but support only takes acknowledgment and genuine effort. Cowardice isn’t definitive of those with mental illness, or those that advocate for them. Cowardice lies with those who are given every opportunity to be different, to be better, yet hide behind the fog of status quo. I’m humbly requesting a face-to-face meeting with the individuals included in this email. I wish to continue to discuss establishing the necessary mental health policies that we desperately need in our league. It is my hope and belief we can find a way to create a better circumstance, a better clarity for our players, our league, all of our families and loved ones, extended communities and young people to which we serve as role models. Maybe, we can even serve as a beacon and example of necessary progress to all that the NBA brand reaches. Today is a time where genuine action is more necessary then ever. P.S. ~ Below is an excerpt from the charter of our leagues mandatory, Rookie Transition Program (RTP).